There are two templates that Bollywood has been following religiously over the past few years. One is the South Indian style mass masala movie and the other is the so-called slick and stylish Hollywood style action movie. ‘Race 2’ falls in the latter category and we already have the earlier ‘Race’ template which is filled with twists, turns and unpredictable happenings. So director duo Abbas Mustan’s ‘Race 2’ is a loyal follow-up to the earlier ‘Race’ with the aforementioned Hollywood elements like eye-catching locations, nicely executed action scenes, bikini babes, macho lead men and rich production standards. Shiraz Ahmed has written the movie which is basically a game of revenge and calculating moves set in the backdrop of casinos and billions of money. It also gets predictably unpredictable, like the earlier ‘Race’. 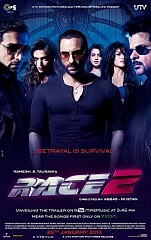 ‘Race 2’ has Saif Ali Khan and John Abraham as the lead players with Anil Kapoor playing the cop with questionable virtues. Deepika Padukone, Jacqueline Fernandez and Ameesha Patel keep the men company in their sizzling costumes. Saif and John have their ‘ishtyle’ moments as well thanks to some good styling and scenes which give them a larger-than-life positioning. All the lead players have more shades of black than white and things like one-upmanship, betrayal, changing sides etc. are like second nature to them. As the tagline says, ‘Betrayal is survival’ for them. Ameesha Patel is the only harmless soul but she is more like an ‘item’ attraction with her dumb questions and plunging necklines. Saif Ali Khan has nothing much to do save look stylish and deliver some punchy lines. John Abraham is a limited actor and he is typically robotic in his performance. He flaunts his incredible body in one irritatingly long fight sequence with another man-mountain. Deepika Padukone looks fab and ups the sizzle quotient several meters high. This leggy lass doesn’t have any qualms in exposing her USP. The wild Jacqueline Fernandez reacts as if she is ready to devour the men who stand opposite her. Anil Kapoor and Ameesha Patel are the typical ‘fruit and nut’ combo as Deepika calls them. They have one scorching scene together as well. The movie has some painstakingly done action scenes, choreographed by Peter Hein, thanks to healthy doses of inspiration from movies like the Mission Impossible series, Bourne Ultimatum and Casino Royale to name a few. But the action in the climax reaches the heights of silliness and has the potential to become a viral joke. Sample this. Saif Ali Khan launches himself out of a burning airplane from a supercar within and later, parachutes spring out from the car and save it from crash landing! You have to experience how audiences are reacting to this scene. The songs by Pritam are all in party mode and may act as good stress-busters on MTV or 9XM. None of the songs have any role in the movie’s narrative though. They are just like music videos with glamorous film stars. Ravi Yadav’s cinematography packs a lot of aerial shots to give an impression of grandeur. He has definitely done well. Istanbul is the major spot where Race 2 was shot. After a fairly bearable first half, the second half peters out and boredom sets in, big-time. To top it all, we have the above mentioned climax action block as well. On the whole rich production values, a glitzy star cast andthe technical crew’s hard work can only save a movie that much. Verdict: This one isn’t racy and the oodles of glitz and glamor are mere ‘showoff’ elements.